3 bedroom, 3 bathroom with amazing golf course views! Welcome to the "Whispering Palms" at the Mauna Lani Golf Villa's. Known to be one of the best buildings in the entire complex, I-2. Leave your shoes at the door and your cares far away as you enter into this spacious, and relaxing home. Our home welcomes you with three bedrooms and three bathrooms, as well as a spacious loft complete with a large flatscreen TV and a sleeper sofa that pulls out to a queen sized bed. Our master bedroom has a king size bed and luxury bath, to soak away any troubles, as well as a stand alone rock floor shower. The master bedroom also has a flatscreen television. The second bedroom has twin beds and a beautiful full bath, and the third bedroom has another comfortable king size bed and flatscreen television. The living area is very spacious as well as the dining room, with comfortable seating for 6. The luxurious kitchen has granite counters, and is fully equipped for your gourmet needs. Need to do laundry? Our home is complete with a washer/dryer and supplies for your convenience. Step out onto the relaxing lanai's, one off of the master bedroom where you can enjoy a glass of wine as you watch the sun sink into the horizon. The other lanai has an outdoor kitchen ready for you to grill your fresh catch of the day! Anything you can think of is supplied just for you, including cable and WiFi. Just a short one minute walk away you will find, a tranquil pool, relaxing hot tub, complete workout facility, and a spacious BBQ area. Don't forget to pamper and treat yourself to a day at the Mauna Lani Spa. Stroll along the shops at Mauna Lani, and have a delightful lunch or dinner at Tommy Bahama's, or Ruth Chris Steak House. Tee time you say? 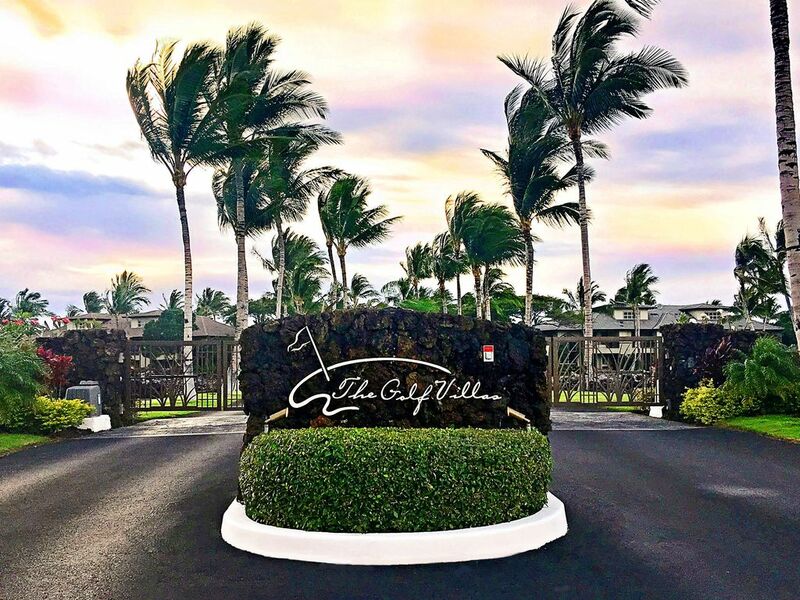 Look no further as the Mauna Lani Golf Villas is built around the famed Francis H. I'i Brown Golf Course, aka the Mauna Lani North and South Courses, home to the Senior Skins game from 1989-2000. Our very private lanai is right along the 9th fairway of the South Course. Take advantage of the amazing amenities, including private access to the Mauna Lani Beach Club which is perfect for sun bathing, swimming, paddle boarding, kayaking, and snorkeling amongst the protected reef. Stop by the restaurant at the Beach Club for a refreshing cocktail and dinner after a long day of play. Visit many of the world class beaches nearby, including Hapuna State Beach with it's crystal blue waters and white sands. Perfect for boogie boarding! Enjoy shopping, and fine dining at the Mauna Lani Shops, as well as an upscale grocery store, Foodland Farms, to stock up your kitchen needs. Upon requests, we will offer you referrals to many of the activities in the area. Paradise awaits you, just an email away. Cindy and Brad Adams, Colorado natives discovered the beauty of the Big Island in 2009, and never gave up on their dream of owning a piece of paradise. Cindy describes it as her "happy place", and often can find her snorkeling and enjoying the beautiful underwater life. Brad is an avid golfer, and can't get enough of the Mauna Lani golf courses. We completely fell in love with this home due to it's spaciousness and how private it is. We absolutely love the Big Island, it's so diverse. The home is very private, and we love sitting out on the lanai's and relaxing. I love listening to the birds, that reside in the large tree in the back, in the early morning. It is perfect for our family, and know that it will be for yours as well. It's situated at the world famous Mauna Lani Resort area. Stunning 9th fairway views from the rear of the condo. This is the perfect location for a golf getaway. The condo was perfect. Thank you so much for allowing us to share your island getaway. We would definitely stay again. The property is beautiful inside and out, well stocked with all the needed beach items and much more. Close to really good beaches, dining and golf. Definitely want to come back! Spacious well appointed condo in a great location! We had a perfect stay at Whispering Palms. Its location is an ideal base to access the many beaches on the Kohala Coast including the Beach Club (access provided by the hosts). The condo was very spacious and we enjoyed the many amenities which included a BBQ and well stocked kitchen. Also, we loved all the beach gear and sand toys. A big thank-you to the concierge, Jen, who greeted us to show us around and was quick to respond to any questions we had! We would definitely return if coming back to Hawaii! Ground were perfect, condo was well stocked with basic needs including spices, pots, pans, soap, shampoo, conditioner, beach towels, sunscreen, beach umbrellas, chairs, toys, and snorkel gear. Accommodations were allowed when we got in earlier than expected and we were allowed in a few hours earlier. Jennifer (local facility manager) was impeccable when we ran out of propane for the grill and accidentally left behind a belonging. She went out of her way to pick up the belonging from the unit and bring to a drop off point to find its way back to the mainland (many thanks for taking your precious time in doing so- true aloha spirit even if it meant another errand to run). The only downfall-in no part of Cindy or Jennifer- was us beating our bags to Hawaii by 1 day. Dear Gerald and family, we are so glad you had such a wonderful stay at Whispering Palms, and so pleased to hear that Jen was so helpful with your needs. Looking forward to you coming back again. We are so happy to hear that you had such a wonderful time, and enjoyed yourselves at Whispering Palms. We are looking forward to your coming back again next year. We loved this unit... we have stayed at the golf villas for over 5 years... this was our sixth year staying and we had to switch condos as the one we rented for the passed 5 years sold... we found this and we could not be happier!!! Loved it!!! We will be back for sure!!! We are so happy that you found Whispering Palms, and enjoyed your stay. We are so looking forward to you coming back and staying with us again!